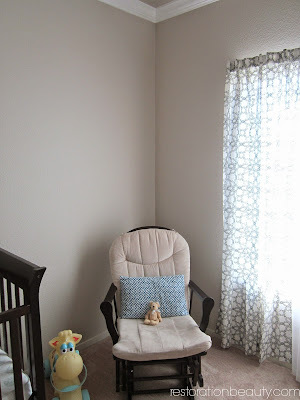 As promised I'm doing a quick update on what's been going down in our baby boy's nursery (we still don't have a name yet so "baby boy" is what we've been referring to him as lol). 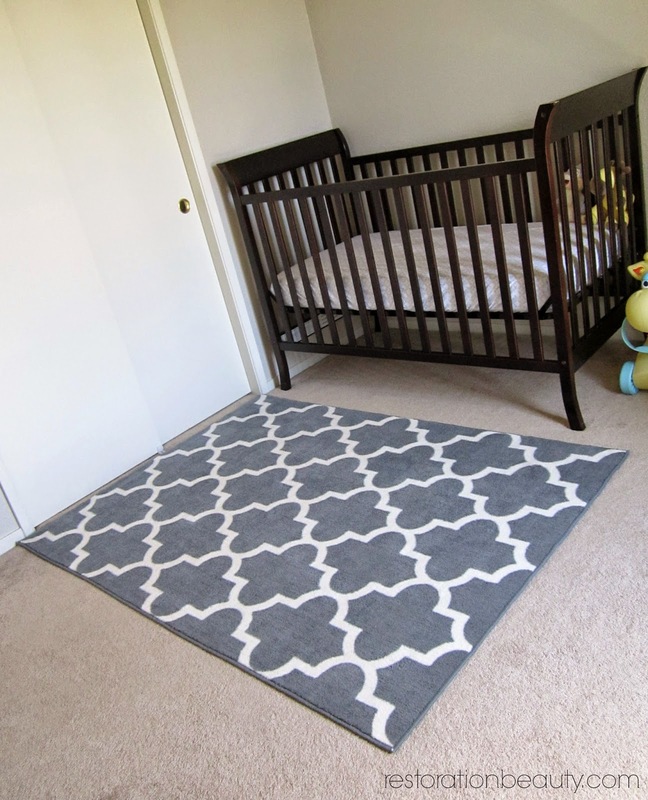 Today marks the beginning of my third (and final) trimester and it feels so good to be getting things crossed off our to do list for this nursery! 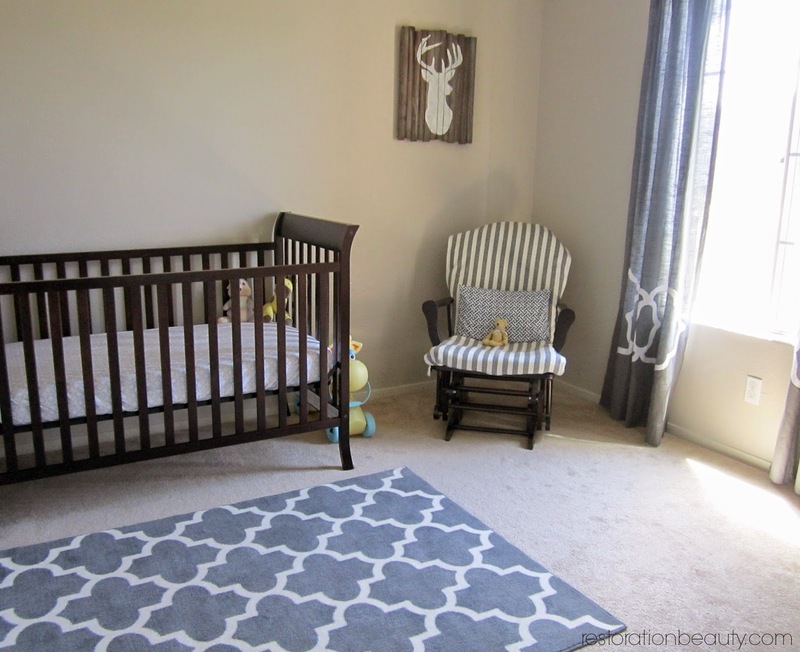 I now have a style/s to describe this nursery: Modern Rustic! I wasn't sure where I'd be taking this space in the beginning but after some changes and tweaks, I think I'm finally happy where this place is going. 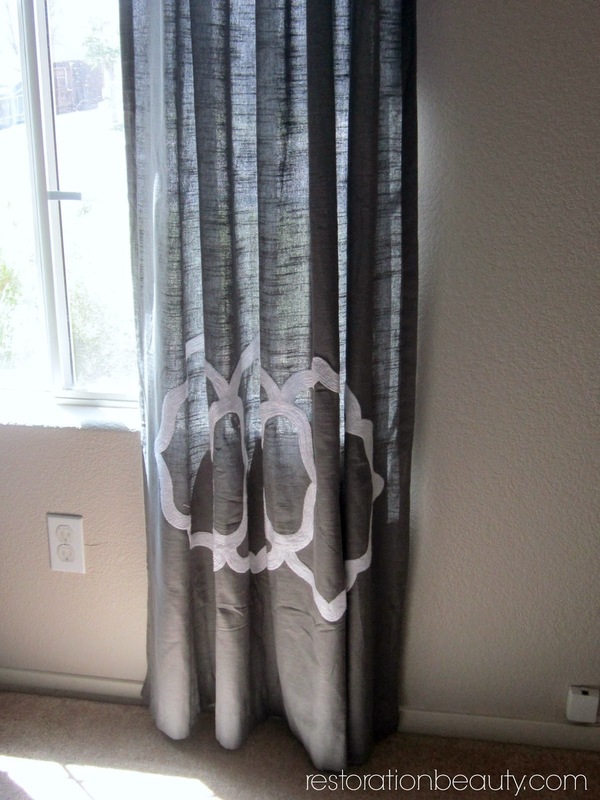 The previous black and white curtains we had have been replaced with these grey one's from Target with an embroidered design on the bottom. I loved the black and white one's but I love these a little more. Okay, a lot more! 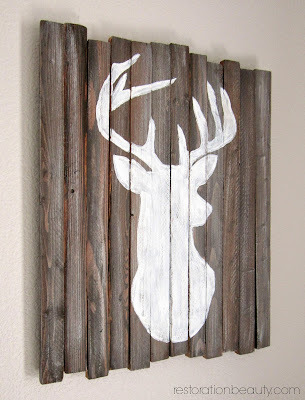 And without this Deer Head Silhouette I made, the room would be void of the "rustic" style. I still swoon over it every time I walk by the room! Since everything so far has been kept neutral, I decided for the gallery wall to be as colorful as possible! There's still a few pieces to be framed and hung hence the awkward blank spaces. Oh, and ignore the blue tape. I needed a visual for where the dresser is going to be in order to hang the gallery wall art pieces. 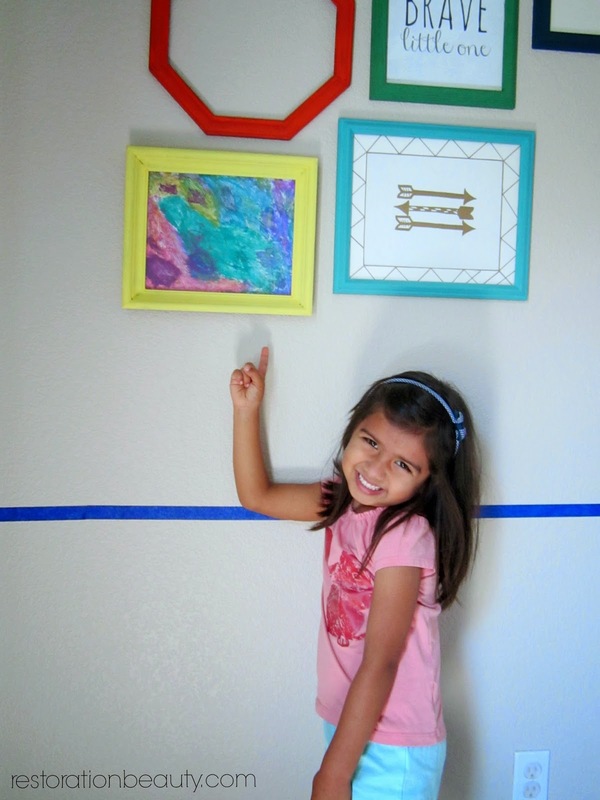 Lily also got in on the DIY fun for this nursery by making her brother this lovely abstract art painting. Can you tell she's so proud? And how cute is this coat rack I found at Hobby Lobby? 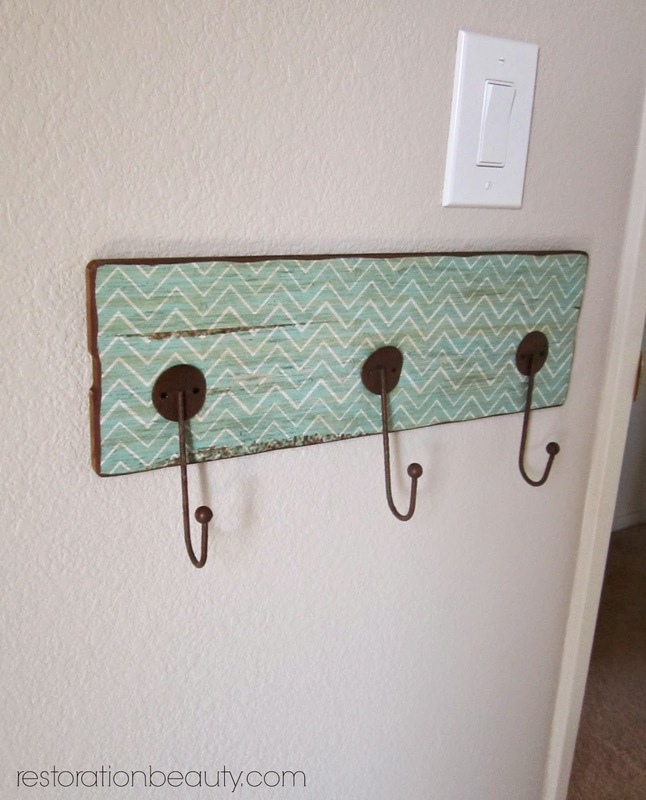 I love the detail of the rusted hooks over the distressed chevron striped plank. I had previously thought that I would be reupholstering the glider but I found a lazy easier solution and that is to place a throw over it. Problem solved and it only took me like a minute! It also stays in place after sitting on the glider so I think it's pretty genius. 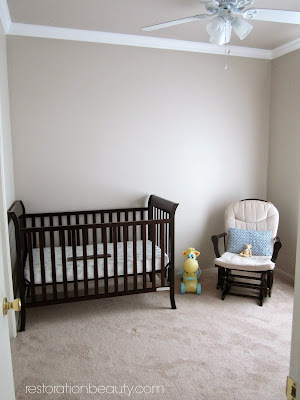 I've also changed my mind about painting the crib and glider white. The moment I hung the deer head silhouette, it just tied all those warm browns together. What I plan on doing instead is distressing only the glider. I just don't think it would have the same rustic feel with the furniture painted a clean white. This totally simplifies things for me too! Well that's it for now! We have a couple projects in the making as I type up this post so I'm sure you will be seeing them around soon! And I promise not to change the whole color and style scheme next time around! 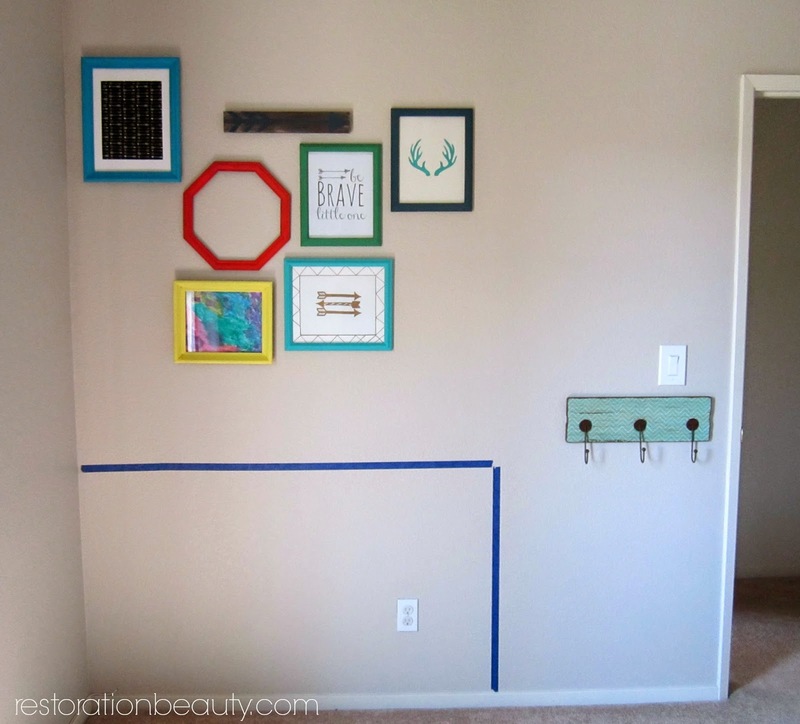 I did that blue tape thing too so I could hang my gallery wall in the nursery! Great progress Selene! Wow! Its really coming together! It looks great, I love the new curtains and gallery wall! I use that blue tape all the time to get a visual. Works great! Love where the room is headed. 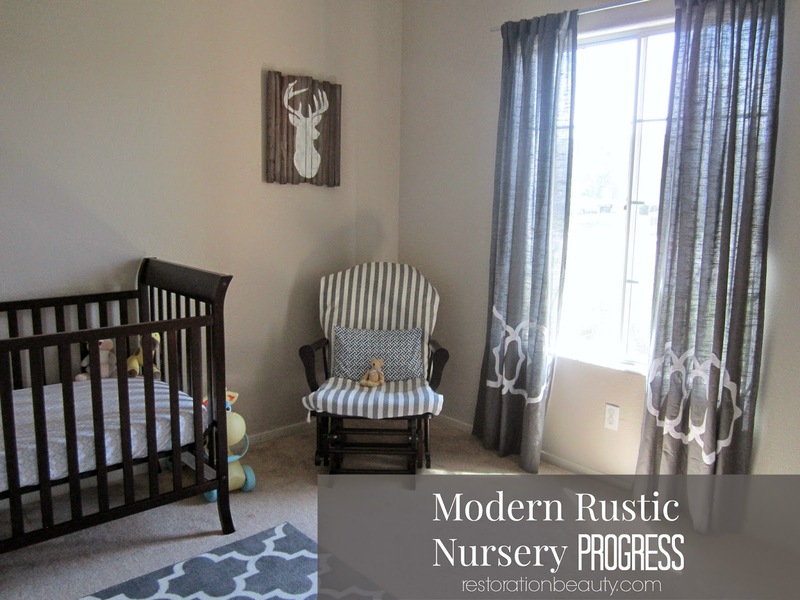 Modern rustic is perfect for a baby boy. I love that Lily made a little contribution to his room too!